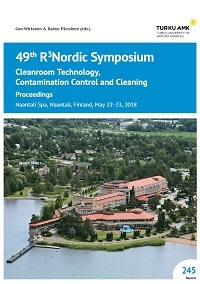 R3-Nordic, the Nordic Society of Cleanroom Technology, is a non-profit, independent association for the promotion of new technologies in cleanroom technology and contamination control in the Nordic countries. The aim of the annual R3Nordic Symposium is to provide knowledge within the pharmaceutical, food and biotech industries as well as hospitals and hospital pharmacies. This publication contains the accepted full papers and extended abstracts presented at the 49th R3Nordic Symposium. The presentations deal with construction and design, planning, auditing, contamination control, cleanroom technology and management, sterilization techniques, cleaning of clean rooms, protective clothing, monitoring techniques, rapid test methods and regulations in clean and controlled rooms.